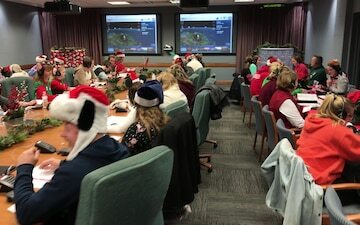 The NORAD Tracks Santa program has been around for a long time--since 1955 to be exact! We believe that Santa Claus is alive and well in the hearts of people throughout the world. 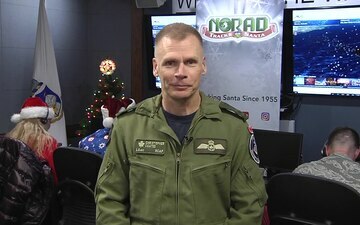 Starting December 1st, countdown to Santa's flight at www.noradsanta.org. Beginning at 2:00a.m. MST on December 24th, you can track Santa live as he takes his historical journey around the world and watch videos from NORAD Santa Cams of Santa and his reindeer! 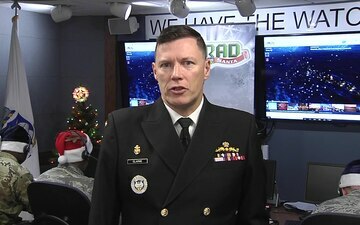 Rear Admiral James Clarke talks to a KALB-TV reporter in Alexandria, LA about NORAD Tracks Santa. 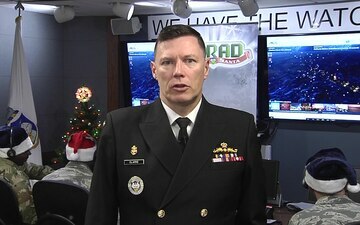 Rear Admiral James Clarke talks to a KAKE-TV reporter in Wichita, KS about NORAD Tracks Santa. Lt. Col. Karl Fruendt is an Individual Mobilization Augmentee (IMA) logistics officer. He is also the voice of NORAD Tracks Santa. Capt. Cameron Hillier talks with a Weather Nation TV reporter about the 2018 NORAD Tracks Santa event. John Cornelio, Deputy Director NORAD and USNORTHCOM Public Affairs talks to a WBRC reporter about the 2018 NORAD Tracks Santa event.